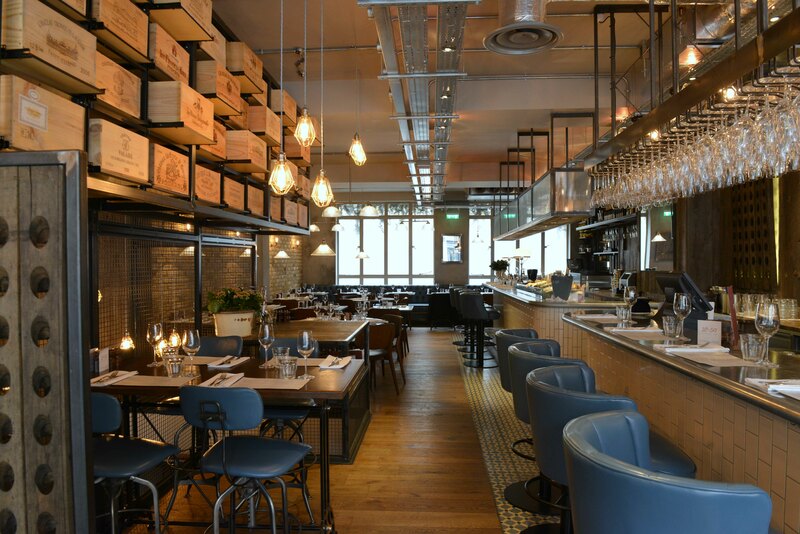 Located in the heart of Mayfair, 28°-50° is a Wine Workshop and Kitchen, a ‘wine & dine’ bistro owned by the successful team behind the Texture restaurant group. The Maddox Street venue is the newest addition to the award-winning group, backed by Michelin starred Chef Patron/Owner Agnar Sverrisson. As you’d guess from the description, 28°-50° specialises in all things wine related and prides itself on having one of the most unique wine lists in London, with Head Sommelier Clement Robert MS putting together an impressive list which changes every three months. Having over thirty wines available may strike fear into the heart of a diner, unless of course you’re a part-time Sommelier, but that’s the beauty of the wine workshop and kitchen; 28°-50° specialise in food-pairings – teaming the best selection of wine to your choice of food, meaning that you don’t need to understand or identify the subtle nuances between a 2015 Cotes du Tarn or a 2012 Barolo, and that’s before we get to the Collectors wine list, which includes such gems as a 2001 Château Pétrus or the 2009 Meursault Les Narvaux. Designed to be impressive while retaining an air of relaxed dining, 28°-50° is spread over two-floors; the ground floor is a gorgeous dining room featuring vintage style lamps, marble tables and white tiles, while downstairs you’ll find a cocktail bar, wine display and the open kitchen – is there anything more satisfying than watching people at the top of their game preparing your food? Except for maybe watching the world go by from the comfort of the front outdoor terrace – experience al fresco dining, a glass or two of some of the finest wines (that you won’t find anywhere else in the capital) and people watching. Perfection. With dishes such as Norfolk Horn lamb shoulder, suckling pork belly and native lobster, the restaurant menu is a mixture of modern European dining at its best. Executive Chef Justin Leclair works closely with ‘Aggi’ to create something that shows off the latest seasonal offerings to their best, which on their own are something special, but when teamed with the perfect wine … the result is something fabulous and usually quite unexpected. It’s evident that a lot of thought has gone in to making 28°-50° the perfect venue to relax and enjoy yourself; there is no rushing to finish, no need to rub elbows with fellow diners and nothing but friendly, professional service. Whether you are looking to meet a few friends for an informal drink after work, a full dining experience or taking part in one of the Maddox Street numerous wine events, you’ll find 28°-50° is the perfect venue. But be aware, as with most restaurants of this standard, it gets extremely busy – it’s very popular, and rightly so. And as we did, if you’re wondering how the restaurant got its name, 28°-50° are the latitudes within which most of the world’s vineyards are located.